For those of you that do not have a rom of Super Metroid: I HIGHLY SUGGEST YOU GET ONE NOW! [url=http://sukamax.hp.infoseek.co.jp/hackrom.html]Go here. [/url] Ignore the 'Download Japanese Text Support' thing if it shows up for you. Click on the top-middle image, with Samus and the red Space Pirate. It will ask you if you want to download it. 'It' is a patch for SM called Metroid Legacy. It completely changes the layout of the game, as well as the order you must collect the items, and possibly even boss order. For example, you will fight Spore Spawn in a Red Brinstar-type room, with one of those venus fly trap plants in the center of the room. To get the patch to work, you will need to use [url=http://fusoya.panicus.org/lips/index.html]LunarIPS[/url] to attach the patch to the SM rom. Now go, go and play Metroid Legacy! Note: SINCE I DIDN'T PROVIDE LINKS TO EMULATORS OR ROMS THIS THREAD CAN'T BE DELETED! I'll try checking it out later today. Zelda 3 one. It isn't finished yet. Playing this reminds me of a program made for the original NES roms where you could move around the tiles and change room locations, thus basicly making your own game ^^ mm... imma go try finding that now. btw this pretty interesting so far Zeta! =( I tried it and it keeps freezing when I go through a door after getting the Morph Ball. You must've downloaded a ****ty rom/emulator then. Mine works fine. Use ZSNES. Use LunarIPS. Do a google for "edge emu". Be happy as soon as you're granted access to every single dump of every single NES, SNES, Master System, Genesis, MSX, MSX-98, Amiga, ZX Spectrum, Commodore 64 and MAME rom. Ever. The boss order was a little mixed. If I recall, it was Statue->Spore Spawn->Phantoom->Crocomire->Kraid->Draygon->Botwoon->Golden Statue->Ridley->Mother Brain. So basically Phantoom and Kraid were switched around, as were Draygon and Botwoon. Where are you in the game, Sk? Quoting Zeta: The boss order was a little mixed. If I recall, it was Statue->Spore Spawn->Phantoom->Crocomire->Kraid->Draygon->Botwoon->Golden Statue->Ridley->Mother Brain. So basically Phantoom and Kraid were switched around, as were Draygon and Botwoon. Make your way to the leftmost room with a dot in the center, which contains the High Jump Boost. Then go to where the cursor currently is to get the Wave Beam. Then go down to Norfair to get Super Missiles. After that, go to the leftmost part on this map, where there is a green shutter. Continue and get the Speed Booster. Note that there are many walk-through walls and stuff in this game. I'm going to try to make a Legacy map. I'm also going to try another patch; Metroid Limit. Right now i'm very much so stuck in this area, where I'm at now is the spot i'm trying tobacktrack through but having problems. Already got charge, super missles, and wave beam. If you Speed Boost from the Dachora room to the room the cursor is in you should plow through some Speed Blocks. After that go back to the bottom right of the room you got the High Jump Boots. There should be some Speed Blocks to go through there. Give me a few minutes and I'll post another map. Quoting Zeta: If you Speed Boost from the Dachora room to the room the cursor is in you should plow through some Speed Blocks. Oh, you didn't get the Booster? You know where you got your last E.Tank, on the bottom left of the map? Bomb around the hall before that, and one of those lift things should come up. Get on it, then bomb jump and bomb the ceiling to open a hole leading to the Booster. EDIT: Watch out for the Giant Sidehoppers guarding the Booster. Quoting Zeta: Oh, you didn't get the Booster? You know where you got your last E.Tank, on the bottom left of the map? Bomb around the hall before that, and one of those lift things should come up. Get on it, then bomb jump and bomb the ceiling to open a hole leading to the Booster. OMG that was soooo retarded! I bombed that entire hall twice and never hit it -.- I knew there must of been somethign there but when I found nothing (I was just bombing and rolling, not checking every specific tile) I just tried backtracking. I'm going to try to get some mapping done now. 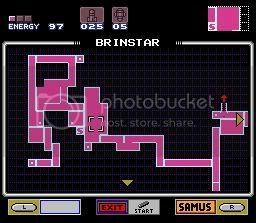 This is all of the Brinstar area I could find, though I'm probably still missing some. I editted the map to show which rooms connect. The upper left elevator leads to Maridia. Crazy, no?